Enter this stunning ranch home to see straight through to the lake with its own island and beautiful sunset views! 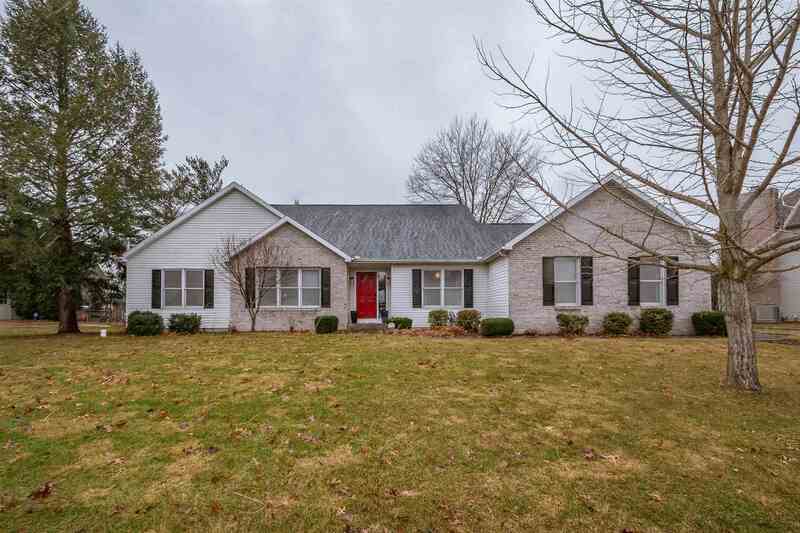 This is your opportunity to own a home in the Northpoint, Discovery, Penn school system that has a beautiful setting with a unique floor plan and features. The sellers have completely remodeled this home from top to bottom, including having a wall taken down to create a super bright open floor plan. The gorgeous kitchen was just completed in 2018 using high-end choices for countertops, backsplash, and appliances. The gigantic island seats several people and has room for serving the largest of gatherings. New hardwood flooring is throughout the majority of the main level, which includes an office and a common gathering space near the bedrooms which shares the great room fireplace. The master bathroom was also completely renovated. Other updates include paint, carpet, door hardware, and lighting. The lower level in this home adds almost another finished 2, 000 sq. ft. Although advertised as a 3-bedroom home, there are 2 large rooms in the basement near the egress windows and the full bathroom. Make sure to check out the newly finished exercise room. There are too many features to list--must see to appreciate all the sellers have done to make this home special and current for this market.